We hadn't had a drink of water since Kargil. On the first day of our bus ride to Leh we had run out of water, when we arrived in Kargil no stores stocked liquids, Yann and Jochen searched the entire town and came up with one overpriced carton of apple juice that we split among four people. For the second day of our we desperately asked for water or any form of non-tea beverage, but were informed that most shops hadn't had such imports for over six months. Leh was no exception with no shops stocking any drinks, by the time we checked into our hotel I was suffering from the two day bus ride, a full day without water and the 3500m altitude. Jochen was in additional pain, suffering most likely from the tap water he drank in Kargil or the mysterious goat meatballs we ate for dinner (I could only manage to bring myself to eat half of one). My first task in Leh was to convince Yann to book a flight to Delhi, as much as I enjoyed the scenery on the Srinagar-Leh highway I couldn't bear the thought of doing the ride again. There is a second route out of Leh, that doesn't pass through Kashmir, but its opening in the upcoming month didn't look very promising. Rather than risk not getting a cheap air ticket, we purchased the cheapest one we could get our hands on, the inaugural flight out of Leh with budget Indian airline Air Deccan. I wondered if this would be any safer than the bus ride, but it would certainly be shorter, at one hour instead of 3 days. 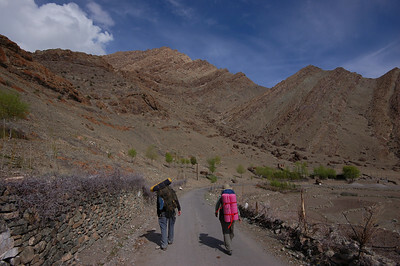 After a few days of recovery, we set off on our first trip in Ladakh. 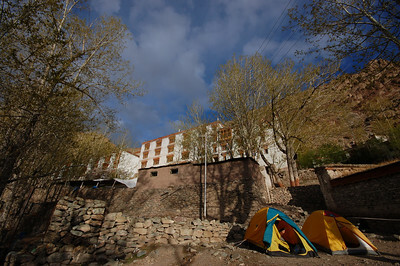 We rented tents and sleeping bags and headed about 50km down the Leh Valley to the large Hemis Monastery. We boarded the local bus, one of the most packed buses we've ever been on, and arrived in Hemis at dusk after over 3 hours on the road. When we pulled up to the monastery, the only people left on the bus were some monks and the bus was greeted by a small army of young novice monks that came pouring out of the nearby hills and forest to greet their seniors and see what goodies they had brought from the big city. We were inspected curiously, then ignored. In the peak season Hemis attracts hundreds of visitors a day, mainly on the monastery tours running out of Leh, so a foreign face wouldn't be of much interest to the monks. There are no hotels or guest houses in the small town of Hemis, but we knew there was a campsite on the grounds of the monastery which is why we had made the trip so late in the day. The campsite was surrounded by large stone walls and the only gate was padlocked, we were told the man in charge might arrive from Leh in the evening. We sat with our tents and bags and waited for his arrival. During this time, it became darker and colder and the only person who seemed willing or interested in talking to us was a young carpenter, who thought we were crazy to be camping in the "freezing cold" and begged us to stay in his room. We compromised and agreed to come have dinner in his room. We gave up waiting for the campsite manager and pitched out tents right outside the monastery on the only flat ground we could find, we got what seemed like consent from one of the older monks. We were grateful for the young carpenters' hospitality. He was 22 and had moved to the monastery for work, from Punjab. He spoke no Ladakhi (and virtually no English) and he seemed desperate for some human interaction. He lived in a small room on the ground floor of the monastery, with a pile of blankets and a small cooking stove, the monks had afforded him what seemed to be one of the coldest locations in the entire monastery. We cooked instant noodles and he made us tea, eager to share his meager supplies with us. He wouldn't share dinner with us, but he accepted a chocolate bar and some dried apricots. We slept well, actually Yann slept well. I convinced myself I was dying from Acute Mountain Sickness and Jochen convinced himself that he was going to be eaten by bears (have I met a fellow hypochondriac?). Despite the warnings of unbearable cold, we were quite cozy in our tents and sleeping bags, minus the fact that the smell of my sleeping bag indicated that it probably hadn't been washed for a few seasons. We had breakfast with our carpenter friend who again made us tea while we ate toast and jam. We had about a 25km walk to Thiksey, the next monastery on our tour. After about 10km of lugging our bags, which despite our light packing were made heavy by our rented camping equipment, Jochen suggested we hitch a ride. Yann put up some resistance, but we started flagging down cars as they passed. Most vehicles were army trucks who didn't seem keen on stopping for us. We finally managed to flag down a clown car sized vehicle in which we squeezed our three bags and our three bodies. Our reception in Thiksey was rather warmer than that of Hemis. After being told there were no official campsites, we found a local woman who was willing to let us camp out in her front yard. Her three young children were amused by our presence and their young woman helped us clear a patch of ground and even spread out blankets for us to place our tents on (despite our objections). Our new campground was right at the base of the huge Thiksey Monastery and in the evening our young host served us tea in fancy cups and saucers right to the door of our tents. We woke up before 6a.m. the next morning to climb up to the top of the monastery and arrive in time for morning puja (prayers). We even arrived early enough to climb on to the roof and watch the call for prayers. Upon entering the prayer hall each monk must make three prostrations, consisting of holding your hands together over your head, your mouth, and your heart, then lying down on your stomach with your arms completely outstretched. 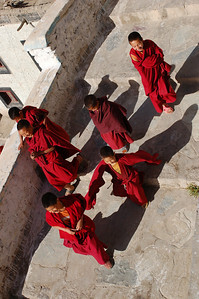 The young monks do this at extremely high speed and with extreme sloppiness. The senior monks meticulously complete the ritual before taking their seats. The young novices pay little attention during prayers, mainly fidgeting and whispering to each other, the older monks make up for it in their complete seriousness. 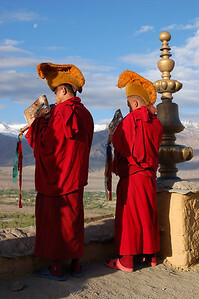 The morning prayer session appears to be a mix between praying and eating, with the monks taking pauses in their prayers to slurp up their breakfasts at high speed. The morning meal consists of tsampa (barley flour) mixed with butter tea. The minute the prayers break, designated novice monks grab the tea pots or buckets of flour and run down the aisles of the prayer hall serving the other monks. All you can hear in the room is the sound of the tiny footsteps madly running up and down the wood floors and the slurping of the tsampa and butter tea. When all the monks have been served, the visiting tourists are even served butter tea. During he two hour puja there were at least four eating breaks. When puja ends, the young monks pour out of the prayer hall at full speed whereas most older monks remain for more prayer or socializing. 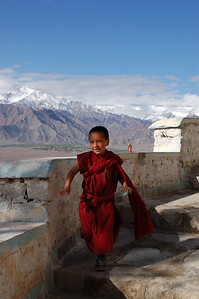 We were received with warmth and attention by the monks and the local family who let us camp in their yard. When we left our campsite, our hosts refused payment other than a few chocolate bars and our half- empty jar of apricot jam. 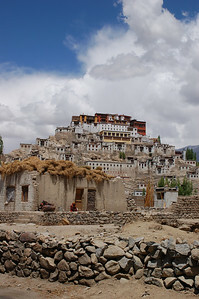 From Thiksey, we walked to Shey Palace, the abandoned palace of the Ladakhi royal family, then we hitched a ride back to Ley. We sat in the back of a pick-up and our drivers, not surprisingly refused payment and dropped us off right at our hotel. So our first excursion was pretty successful, but not so much due to our brilliant planning but the Ladakhi hospitality. Very moving hospitality.Em, don't you think the prayer pre-ritual is very close to the one used by Catholics prior to the reading of the gospel at mass when we make a small sign of cross on our forehead, then on our lips then on our heart. I found that eerily familiar. I think this last photo of the boy is my favourite so far. Really beautiful. 4$ per sheep. That's about the same price Canadian farmers get. Sad but true. 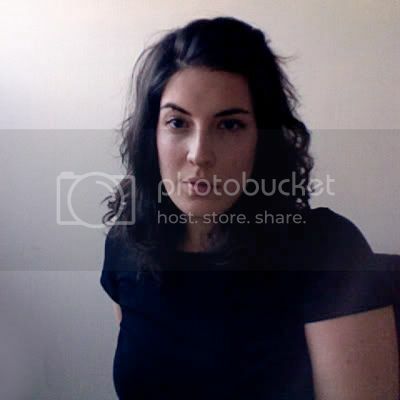 Man, your blog is awesome and your photos are even better!